The ideal bikepacking steed is somewhat difficult to describe. Where a rigid or front suspension mountain bike is perfect for the Great Divide Mountain Bike Route, many prefer a dual suspension machine for rugged singletrack bikepacking. 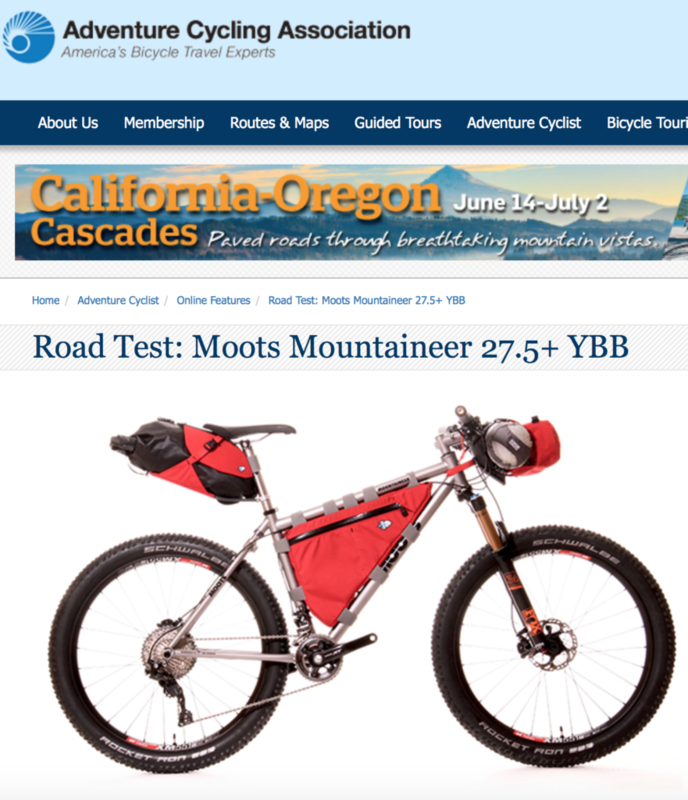 Not everyone can afford multiple mountain bikes, but if you can swing one mountain bike — a spendy one, no less — then the Moots Mountaineer 27.5+ YBB may be the perfect middle ground. With cross country geometry, 120mm of front suspension, and Moots’s legendary softail YBB design, it’s made for long rides. The Mountaineer reviewed here is also a resurrection of sorts. One of Moots’s early models was called the Mountaineer. That steel mountain bike was offered in two geometries, one with racing in mind and the other made for all-day epics. The adventure model had four bottle mounts and even mounting locations for a shoulder pad inside the main triangle for portages. On the new titanium model, the Mountaineer uses 27.5+ tires and Moots’s YBB soft-tail rear triangle, a pairing that goes together like peanut butter and jelly. Together they smooth rough trails significantly better than a hardtail 29er. It certainly isn’t as plush as a full suspension mountain bike, but the YBB system requires far less maintenance, making it perfect for long backcountry trips. Best of all, the Moots looks great while carrying you and your bikepacking gear. The welds, performed by expert fabricators in Steamboat Springs, Colorado, are near perfect. The matte finish is low-key cool and far tougher than paint. After years of abuse it will show scuffs, but if that starts to bother you, simply send the frame back for a quick refinish and new decals. All of these concessions to comfort may lead you to believe that the Mountaineer is a bit of a land yacht. Nothing could be further from the truth, though. The geometry and tubeset give the Mountaineer a lively ride, and it turns into corners in a quick manner that inspires confidence. The surefooted tires help, but so too does the Boost dropout and fork spacing, allowing for shorter chainstays and stronger wheels. Boost spacing, also mentioned in the review of the Pivot Mach 429 Trail in the March issue of Adventure Cyclist[ital. ], refers to the dropout widths both front and rear. If numerical dimensions are your thing, Boost measures 148mm wide at the rear dropout and 110mm at the front. You’ll often see it in bicycle specs at 148 x 12mm and 110 x 15mm. The other number there refers to the diameter of the thru-axle. So why is Boost so great? By increasing the width of the frame and fork, it provides additional tire clearance while maintaining a given chainstay or fork leg length. It also means that hub shells can be wider, strengthening the wheel by changing the bracing angle of the spokes. The downside is that you need to run a compatible crank, especially when using a double chainring. A Boost bike also means that any old 142 x 12mm and 100 x 15mm wheels you may have are relegated to the corner of your garage. The Mountaineer’s threaded bottom bracket is much appreciated, and so too is the oversized seatpost diameter that allows for the use of a dropper post. Ridden with Moots’s own titanium Cinch seatpost, the ride was smooth, though this may be down to the YBB rear end more than the seatpost. A Moots Ti Stem and Enve carbon handlebar completed the cockpit on the Mountaineer. Although the Mountaineer came with Schwalbe’s Rocket Ron 3.0in. tires that worked well in dry Front Range conditions, some riders may want to consider installing a set of 2.8in. tires. This will increase mud clearance, especially in the rear triangle, and drop a little bit of weight in the process. If you want to drop even more wheel weight, the Mountaineer can also accommodate a pair of 29er wheels and tires. In this respect, the modern model reflects its predecessor. The original Mountaineer had cantilever brake mounts that could be adjusted vertically so that riders could use different wheel sizes. Gearing was wonderfully low with Shimano’s latest XT group specified with 36/26T chainrings and an 11-speed 11–42T cassette. If a prospective customer needs to go lower, the XT crank is also offered with 34/24T rings. Shifting was precise across its range, and the 10-tooth jump between the front chainrings made for fewer rear shifts after a front change. Braking also came from Shimano — the hydraulic XT stoppers are fantastic, although lever feel isn’t as crisp as with previous generations. While not included in the cost of the Moots, it’s worth mentioning the Porcelain Rocket framebag. The Canadian bag maker is known for its high-caliber work, and this example was no exception. During my time on the Mountaineer, I never took it off, in fact. Once you become accustomed to riding with a framebag, you find endless uses for them. Whether it’s stopping on the way home to pick up a few necessities at the corner store or stuffing extra clothing, food, and spares, a framebag can change the way you ride. This did mean that on short rides I used a bar-mounted feed bag to carry a water bottle (I avoid a hydration pack whenever possible). But this too only added to my convenience, putting the bottle closer at hand than when in a cage on the down tube. Options available on the Mountaineer include a third bottle cage mount on the underside of the down tube, rack and fender mounts on the frame, and internal dropper post routing. Like all Moots bicycles, the Mountaineer comes with a lifetime warranty. And as much fun as the Mountaineer is, you may end up riding it for the rest of your life, smiling all the way. Tires: Schwalbe Rocket Ron 27.5 x 3.0in. Contact: 2545 Copper Ridge Drive, Steamboat Springs, CO 80487, info@moots.com, 970.879.1676, moots.com.